The "Summary" tab provides an overview of CLR properties and parameters of profiled application, as well as a summary of application telemetry information. The tab is available when the profiler is connected to profiled application, or when you open a saved snapshot. If the profiled application is obfuscated, YourKit Profiler for .NET can automatically restore original names of classes, fields and methods if you specify the path to the obfuscation log file (1). 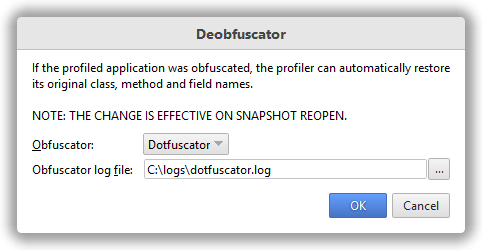 Deobfuscator can be configured for a specific snapshot, as well as when you are connected to the profiled application (in this case the deobfuscator will apply to live results and will be chosen by default for captured snapshots). 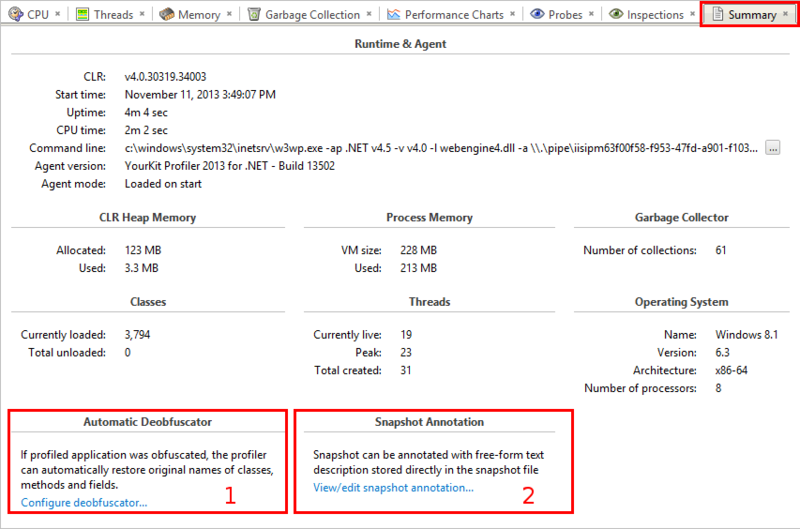 The "Summary" view for a snapshot lets you store free-form text descriptions directly in the snapshot file (2).